The soft, warm fur of dogs and cats provides the perfect environment for fleas and ticks. These insects feed on your pet’s blood and can cause health problems ranging from allergic reactions to serious tick-borne illnesses. Both fleas and ticks are more common during the warmer months, but you can take steps to ward them off any time of year. Flea droppings (dark specks) in the fur. Flea eggs (white specks) in the fur. Scabs or hot spots on the skin. 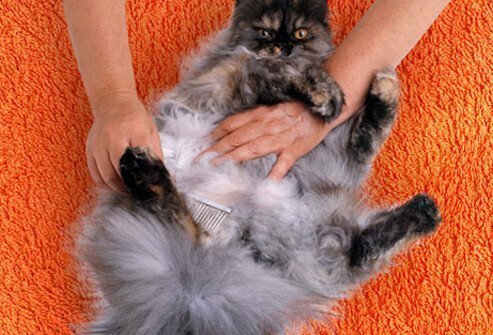 The easiest way to find fleas on a cat is to use a flea comb (a special fine-toothed comb). Especially check the neck and around the base of the tail. You also can check the belly. You may see the fleas -- small dark spots that move -- or their droppings, which look like specks of dirt. 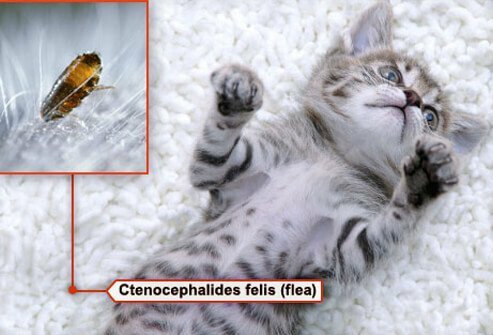 Lots of scratching and hair loss are also signs that fleas may be feasting on your feline. Fleas can take in 15 times their own weight in blood. Dogs or cats that lose too much blood may develop anemia, a dangerous drop in the number of their red blood cells. Puppies and kittens are especially at risk. Signs of anemia caused by fleas include pale gums and lack of energy. Fleas are the most common cause of skin disease in dogs and cats. When a flea bites, it injects saliva into your pet’s skin. This may trigger an allergic reaction. 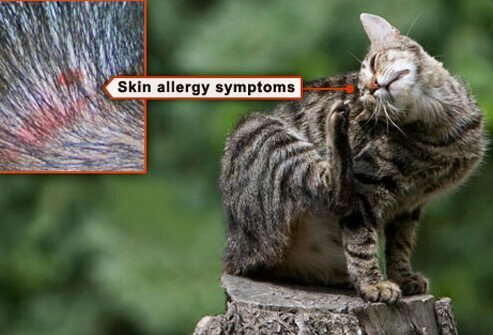 Signs include intense itching, hair loss (especially just in front of the tail), scabs, and red, irritated skin, which may lead to skin infections. Pets can easily pick up fleas when outdoors. 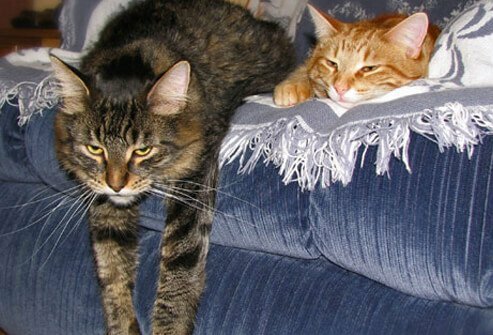 Indoor cats can get them even if they just go out on the patio or share their home with a dog. Female fleas can lay 40 to 50 eggs a day. That can lead to an infestation in days. 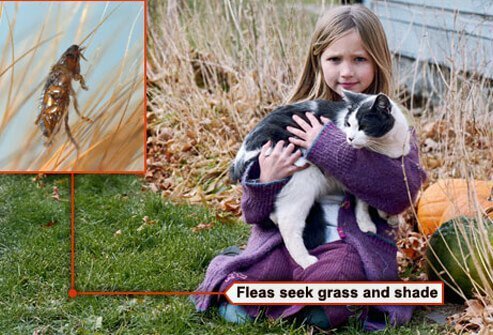 Fleas like human blood too, and they can jump from your pet’s fur or bedding onto your skin. 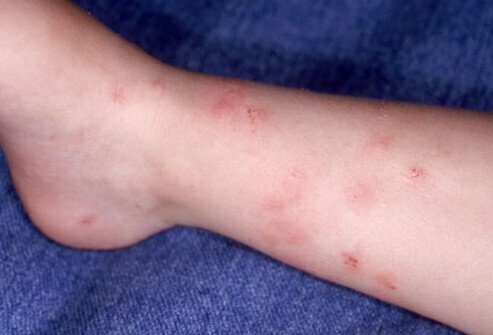 Some people have a bad reaction to flea bites. If you scratch the intense itches, that can lead to skin infections. To avoid flea bites, keep your animals and your home flea-free. For every flea you see on your pet, vets estimate there are 100 more in your house. When fleas lay eggs on your pet, some eggs may fall off and hatch on your carpet, bed, or other furniture. The new fleas then target you and your pet, feed on your blood, and lay more eggs. 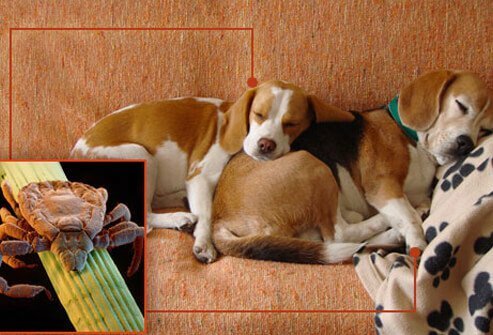 Carpets and humid areas are favorites for fleas. Replace carpeting and keep your home as dry as possible to make your house less friendly for fleas. You can feel ticks when you pet your cat or dog, and you can see them. They most often attach near the head, neck, ears, or paws. On cats, they're usually found around the ears and eyes. Ticks can carry diseases. If you find a tick on your pet, try to remove it as soon as possible. Wash the bite area and your hands. Mouth parts that remain rarely cause serious problems. Questions? Call your vet. Ticks crawl onto tall grass and shrubs and wait for a host, like your pet, to pass by. They can wait for a year without feeding. 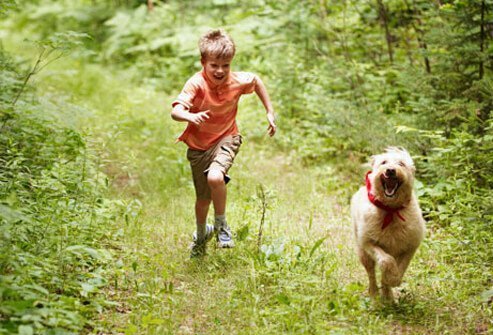 Dogs are most likely to pick up ticks while walking in the woods or high grass from spring through fall. Outdoor cats can pick up ticks the same way. Ticks are more common in warm climates and some wooded areas of the Northeast. The brown dog tick, also called the kennel tick, is common across the U.S. It's unique among ticks because it does well indoors. The adult tick is reddish-brown and usually attaches around the ears or between a dog’s toes. 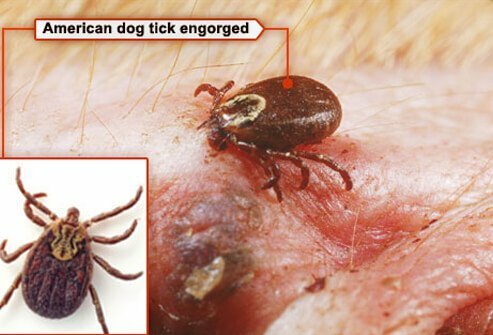 This tick rarely bites people, but it can carry serious diseases that affect dogs, such as ehrlichiosis. Deer ticks feed on many types of mammals, including people. The adults are reddish-brown and live in wooded areas of the Northeast and Midwest. They're dangerous because they can transmit Lyme disease to dogs and people. 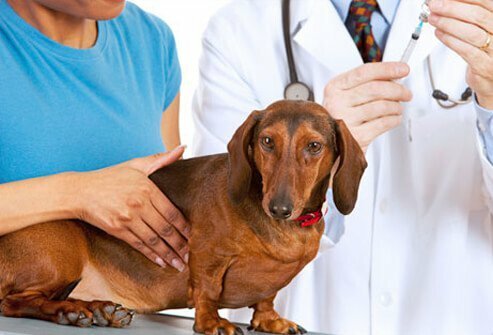 Lyme disease causes fever and joint pain and, sometimes, serious kidney disease in dogs. This is one of the most common ticks. It feeds on people as well as dogs. It’s easy to spot the females, because they have a large silver spot behind the head. They swell to the size of a small grape after feeding. 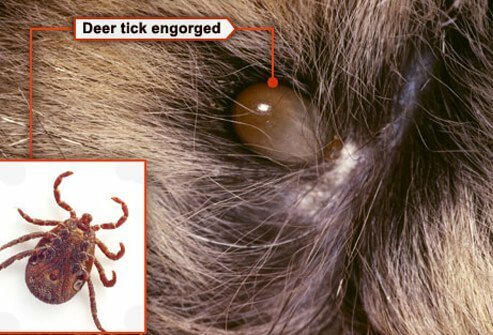 These ticks can spread Rocky Mountain spotted fever, but only if they're attached for at least 5-20 hours. This disease can be fatal in dogs and may cause serious symptoms in people. These diseases can have serious complications, so prompt treatment is a must. Tick-borne diseases are uncommon in cats, but they can get a tick infection called cytauxzoonosis, which is often fatal -- so do your best to keep pests off your cat and out of your home. There is a vaccine to protect against Lyme disease in dogs who live in or travel to high-risk areas. Ask your vet if your pet needs it. Some ticks make a toxin that makes muscles weak. 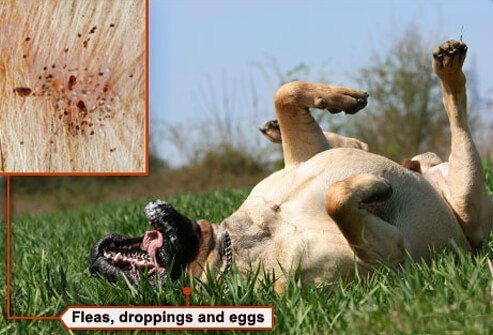 Most dogs recover quickly once you remove the ticks. People can get many of the same tick-borne diseases that affect dogs. 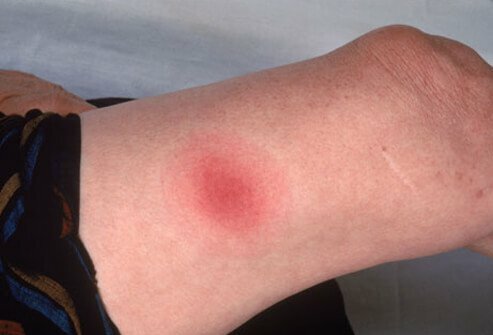 Lyme disease is probably the best known. One of the first symptoms is a bull’s-eye rash. You can’t catch tick-borne diseases directly from your pet, but the same ticks that bite your animals can nibble on you, too. When you remove a tick from your animal, don't touch the tick's blood. 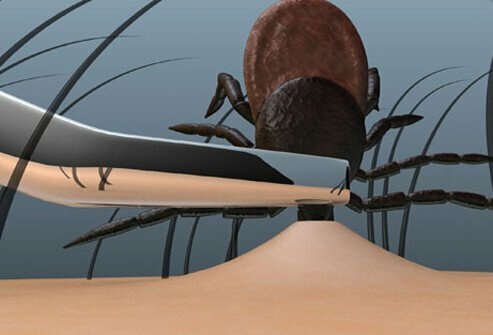 Ticks prefer warm, grassy areas and may thrive in unruly sections of your yard. 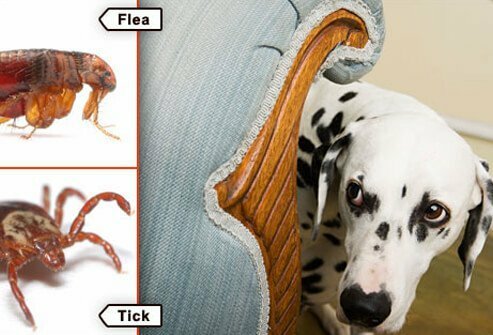 The brown dog tick can also live and reproduce inside your home. 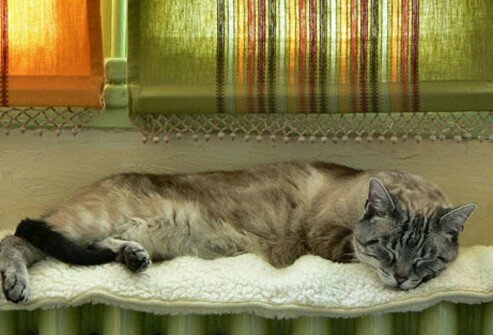 Its favorite hiding spots include cracks, curtains, under rugs and furniture, and behind radiators. 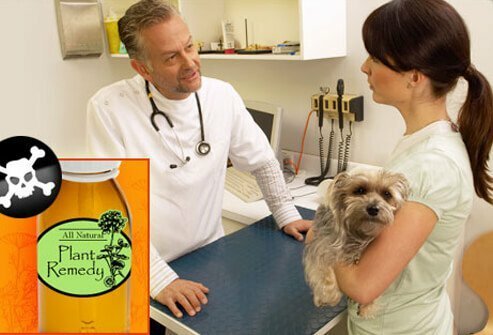 Flea and tick shampoos are mainly useful for killing the fleas and ticks that are already on your pet. They don’t work as well to prevent ticks. Make sure you get the right kind. Some products for dogs can kill cats. You can buy the shampoo without a prescription, but follow the directions carefully. You need to cover the animal’s entire body and wait 10 minutes before rinsing. Flea collars can ward off fleas and ticks. Read the labels and follow the directions on the package. Puppies and kittens may need those with a lower dose of chemicals. Don’t let children play with a collar. Wash your hands with soap and water after you handle it. Dogs and cats can take some treatments, such as tablets, by mouth. One type is a quick fix that kills adult fleas within 30 minutes. You can give it to your pet daily. Other medications, which you give monthly, keep flea eggs from hatching. Another product starts killing fleas in as little as 30 minutes and protects for a month. 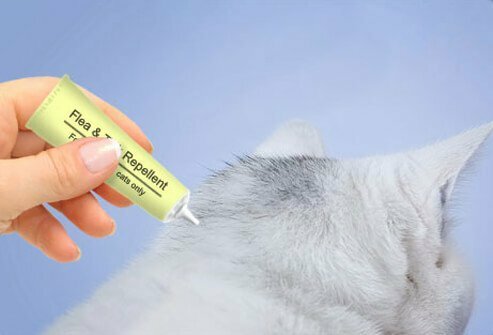 Some flea medications need a prescription. Also, there is a dogs-only oral product that kills fleas and ticks. 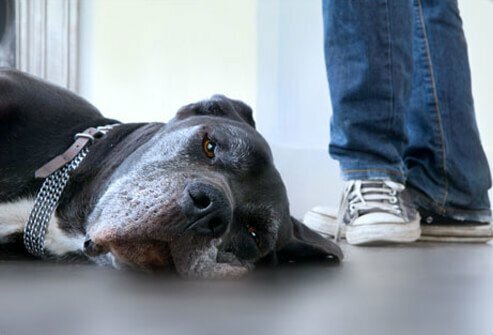 Check with your vet to see which treatment is right for your pet. 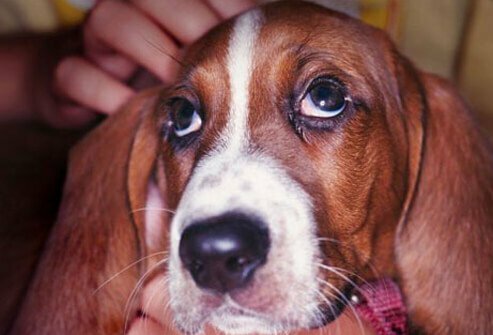 You put these treatments on your dog or cat’s back. They work well for a month. Some kill fleas and ticks. Others target fleas and their eggs. Some dog products can kill cats, so ask your vet which product is right for your pet, and follow the instructions. If you use them correctly, yes. The Environmental Protection Agency says that using them wrong is a major cause of negative reactions. 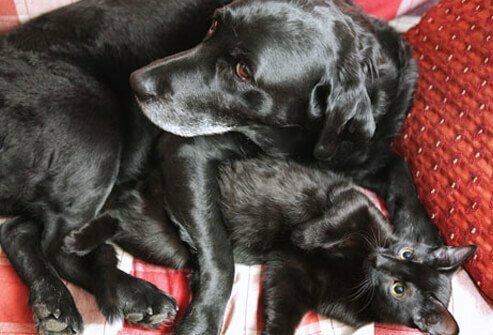 Common mistakes include treating a cat with a product meant for dogs, or using a large dog dose on a small dog. 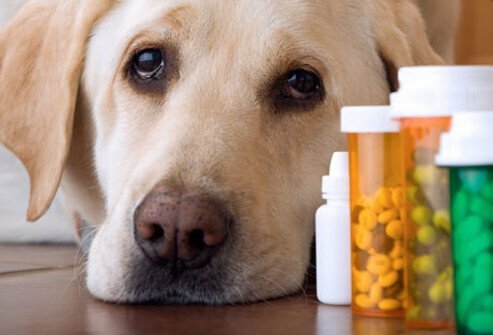 Check with your vet if you aren't sure which dose is right for your pet. Some people feed their pets brewer’s yeast in the hopes that the smell will ward off fleas. But there is no science to support this. One “green” strategy that does work: the flea comb. Flea combs are completely nontoxic and offer a way to remove fleas from pets that can’t take medication. 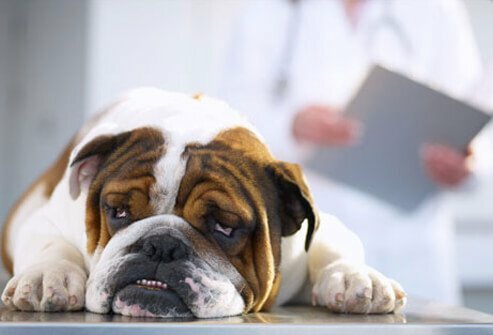 Check with your vet before giving your pet any type of herbal treatment. Should You Use a Fogger? Insect foggers, or bug bombs, kill a lot of fleas at once. They use strong pesticides and are only recommended for severe infestations. 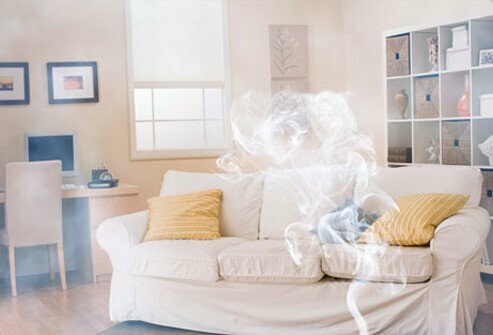 You and your pets must leave your home while the fogger works. Follow the directions to know when it's safe to return. It's dangerous to use too many foggers at once or come home too soon. The first defense is to make your yard unwelcoming to fleas and ticks. Mow the lawn regularly, trim shrubs, rake leaves, and keep garbage covered so it won’t attract rodents. Inside, vacuum carpets often with a rotary brush or beater bar. Empty canisters or throw away vacuum bags. Mop hardwood floors with detergent every week. Wash all bedding often. Brevitz, B. Complete Healthy Dog Handbook, Workman Publishing, 2009. Environmental Protection Agency: "Flea Collars." Illinois Department of Public Health: "Prevention & Control: Common Ticks." Kansas State University: "Pests That Affect Human Health." New York State Department of Health: "Pests and Pesticides." Pet Education: "Common Flea and Tick Control Products," "Flea Control and Prevention," "The Use of Brewer’s Yeast in Dogs and Cats," "Lyme Disease (Borreliosis) in Dogs," "Tick Control," "Ehrlichiosis in Dogs," "Rocky Mountain Spotted Fever in Dogs," "The Use of Garlic & Onion in Dogs and Cats." University of Florida: "Fleas: What They Are, What To Do."